I have to say it was a little strange going to the Black Arrow shoot as a competitor, having been a member for several years. The club has moved from the wooded hillside near Coxbench in Derbyshire where I learnt to shoot to now being located near Lout. Even though it is a different location there were some similarities, including the old trap covered shelter. This new site being a stones’ throw or should that be an arrow flight, from Harlequin archers, Long Eaton, and the new Merlin archery wood. Seems the area is fast becoming a nexus or archery clubs in the midlands. There was a very friendly and relaxed atmosphere at the shoot with over 80 archers or so attending, though I think they had quite a few no shows. Fortunately the strong winds forecast didn’t arrive until late in the day and even then it wasn’t too much of a problem as its quite a dense woodland. The 40 target course would be a mix of 3D, 2D, paper faces and some very well painted hessian faces ranging from badgers to bears. The only downside being not always seeing the detail of these targets until you are up close, so you are having to guess where the scoring zones were. But they did look good. The club has invested in some of the 2D targets similar to those owned by the Harlequin club. One of these being a 2D lion which I hadn’t seen before and was a lot smaller than expected, might explain why it was so hard to hit and see from the white peg thanks to the fast growing bracken. Glad I managed to hit it from the red peg, one of my few good shots of the day. They do also have some homemade 3D targets, including a large bear, complete with a salmon which was the kill zone and a coloured peacock. The only problem being the latter target was still wet though, so I now have a blue and white right boot. As for other shots there were a few framed shots which I quite liked, though I think a few of the peg positions were a bit tight for younger archers and too close to trees or branches that you could have caught a limb on. Our group for the day would be Sharon, myself, D’No aka Dean shooting bow hunter and David shooting AFB both from Hanson. The club catering was great as they had two food stops, which enabled them to run a shoot through, both having a wide selection of cakes to keep archers going along with hot drinks. It’s obvious they are putting a lot of effort into the courses, including building a tower enabling them to set a more technical elevated shot involving height difference. This is something they struggle with being located in an otherwise flat woodland. They had one interesting shot through a barrel and another of a paper face duck over a small pond and used dead ground well. Another nice feature was the way they had covered all their target bosses with camouflage tarpaulin making them less obvious. Marshals were all friendly and proved good at reacting to problems when reported, which is always good to see. Though I think they struggled with the speed of growth of the bracken in some areas as a few shots were very hard to see despite having been trimmed the day before. In all it was a good day seeing friends and catching up with an old house mate Stuart, from university days. On a personal note I think I would have preferred to see some the well painted hessian targets on the closer shots, as I felt some of the small paper faces (Jay, duck etc.) felt a bit stretched. Still Sharon shot well, winning ladies AFB and I managed a second place. It was good to see the club appearing to be thriving and running shoots at their new grounds, I hope this continues in the future. I firmly believe that a successful club is more than just a field or wood and group of people who shoot there. A good club supports its members, nurturing and developing their skills and interests. I believe it should also be somewhat of a social gathering. It is very easy for a newbie archer to get lost and confused with friendly offers of advice or to be too nervous or embarrassed to ask for help. Ideally you want new members to be intimidated as little as possible but not everyone has the confidence to ask questions or seek advice. Many years ago, I was a member of the Black Arrow club in Derby. In fact it was the first ever archery club we joined. Kevin the club chairman and Cherrie the Secretary organised a making and doing session for all the new members who had joined. It gave all present the opportunity to learn the basics of arrow making, string making and how to serve strings. It proved a great success being both instructional and social with Cherrie and Pete (her partner) providing food for all. 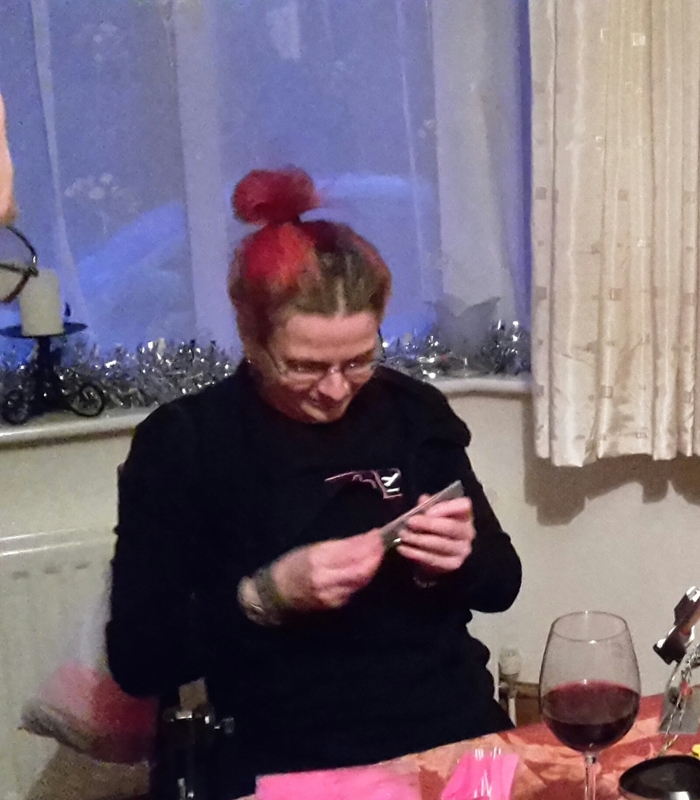 Over the Christmas holiday of 2014 Sharon and I organised a similar event at our house, with the objective of giving a few of the newbies some guidance on making or repairing arrows and a variety of other topics. It proved to be a very sociable afternoon and evening, helped by the contributions of everyone who came and Sharon’s expert cooking. Yes, not only is she a cracking shot but also a great cook. 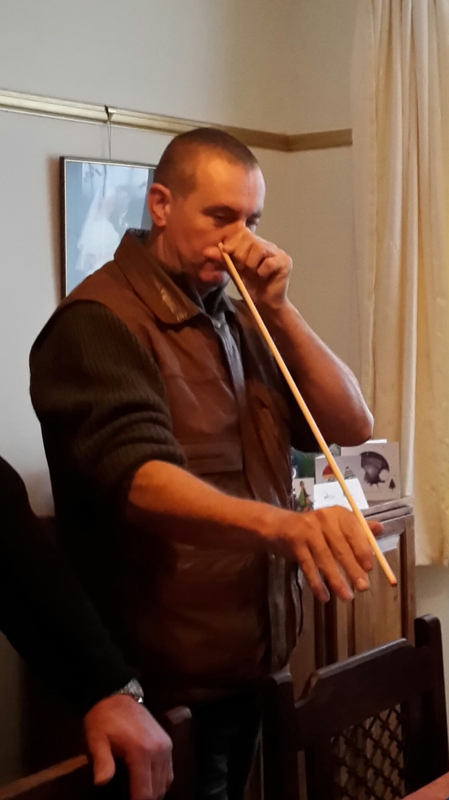 Nigel showing his expertise on straightening wooden arrows. 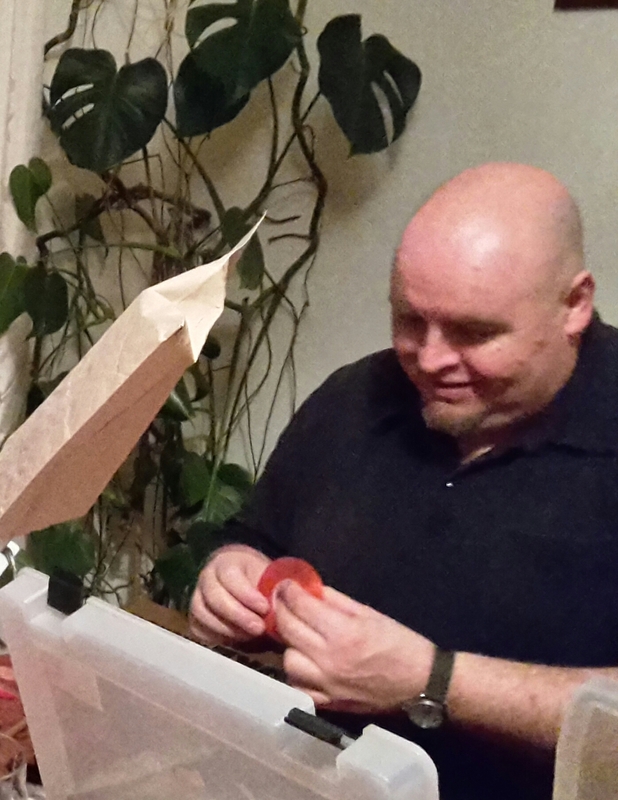 We covered topics of how to make wooden arrows including fletching arrows, attaching piles and nocks. Having a number of experienced archers there proved really useful as each explained how their technique was slightly different from each other enabling a great spectrum of knowledge to be displayed and discussed. The discussion on whether to varnish the arrow prior to fletching or fletch then varnish was one hotly debated topic. An equally debated topic was the merits of different glues for attaching piles to wooden shafts with some preferring hot melt over epoxy glues. All the advice and comments were provided freely and in a relaxed atmosphere. Whilst arrow making was going on in one room, arrow straightening of aluminium arrows using our straightening jig was being demonstrated in another. There was also just enough space to demonstrate applying serving to a bow string. Discussions went on long into the night on different techniques and it was a very sociable evening. Our thanks to all who contributed their time and advice. With everyone at the wood the following day even more discussions took place, this time with archers showing off their arrows they had made previously and again citing the merits of varnishing first or other such topics. So if you have the opportunity to run something similar to this at your club go for it. It doesn’t take much planning and benefits can be huge. Thanks for reading and to all those that attended. Special thanks to Kevin and Cherrie who set the bar so high all those years ago. Oh, Kevin if you are reading this remember the glue. This week I received some sad news from my old clubs (Black Arrow) chairman Kevin Bunting, concerning the passing of a well know archer and fellow club member Roy Bickerstaffe. Kevin has put these words together and asked I share them with the wider archery community. Roy shot both target and field in those days and was very proficient in both, swapping with apparent ease between the classic target ‘Freestyle’ and ‘Heavy Tackle’ as Hunting Tackle was originally known. Roy involved himself in all aspects of the sport: administration, coaching and, of course, shooting. 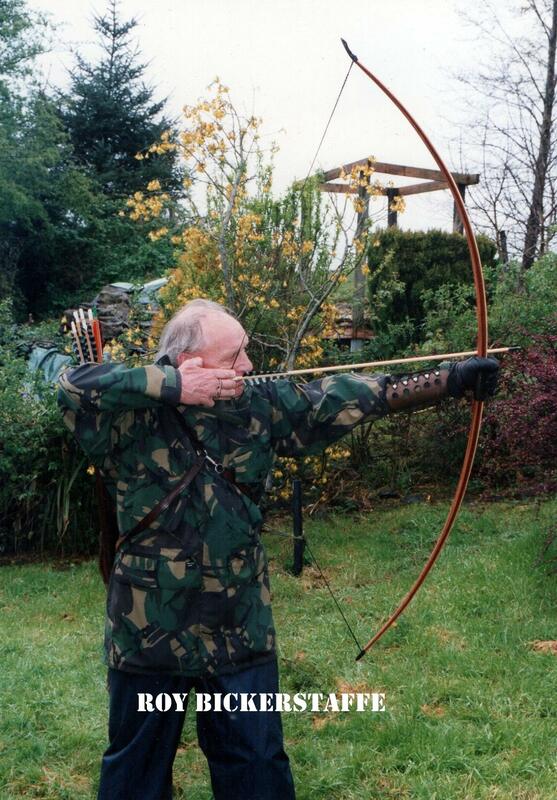 In 1970 the BFAA merged with the EFAA and soon Field Archery as we had known it was changing and not for the best. Roy with a few others decided that enough was enough and with the hindsight afforded by their experience of the BFAA and the benefits of a clean sheet of paper, founded the NFAS in 1973. This gave field archers the wonderful opportunity to again engage with the sport as they wanted. True, the NFAS migrated down a path they may have strayed somewhat from Roy’s vision but there is not a single true field archer that does not owe Roy and his band of merry men and women a debt of gratitude for what we all enjoy today. Roy could talk for hours on a wide range of subjects and frequently did and there are many who have missed appointments, meals, loved ones and sleep as they tried without success to prompt an end to the dialogue or rather, monologue. But one thing is for sure….that all who benefited from time with Roy was the richer for it. I’d like to pass on my condolences to all the Bickerstaffe family. Though I only met Roy a couple of times when I first started shooting as Kevin says he had a wealth of experience that he was always willing to share. Thank you, Roy for all the work and effort you made to a hobby I have the privilege to enjoy.